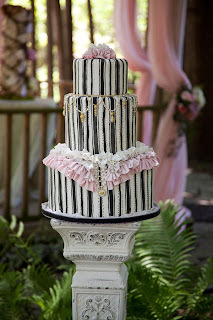 A selection of beautiful, classy and elegant pink and black wedding cakes to inspire you! Black and white stripes with pink ruffles and delicate gold cake jewelry for this uniquely stunning wedding cake. 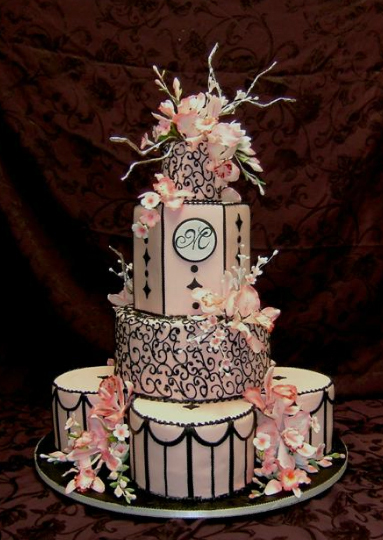 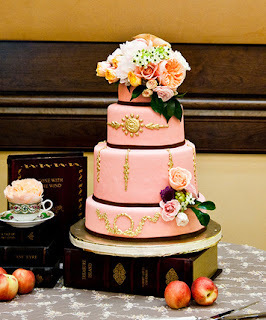 Exquisite three tier wedding cake in a soft pastel pink with ornate black trimmings. 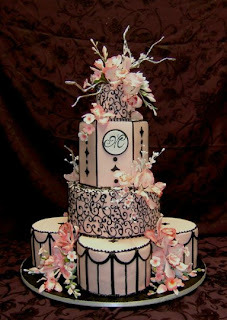 Four tier pink and black wedding cake with gold leaf decorations. 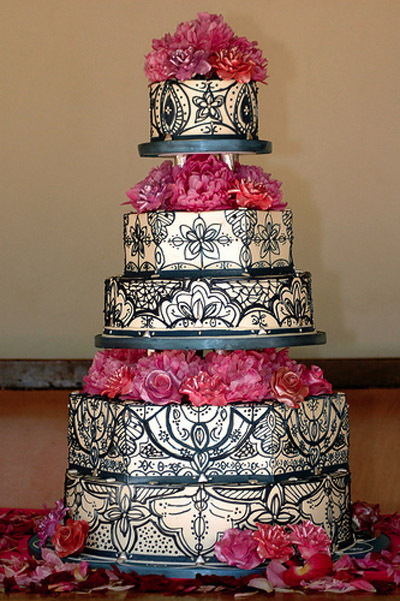 Luscious pink flowers between the tiers and beautiful, ornate black and white pattern for a genuinely sophisticated wedding cake. Funny, zany, off the wall, unique a bit morbid but cute at the same time....Skeleton Cake Toppers! Lets see what varieties are available to top off your wedding cake! 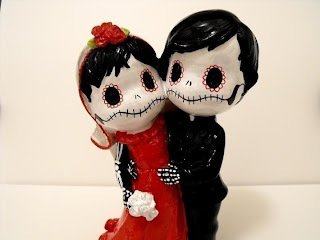 So let's get straight into our Day of the Dead theme. 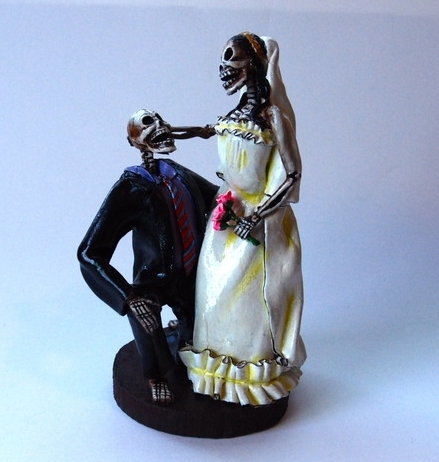 They are handmade and hand-painted in Peru. These couples are truly works of art. 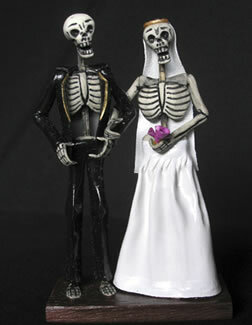 The bride and groom are embracing in eternal love! 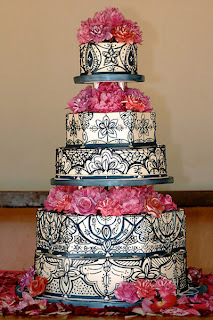 The two images below are from graygoose.com. 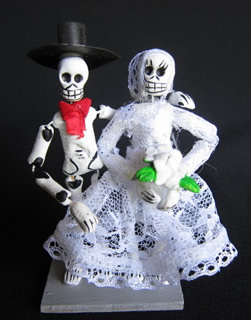 Day of the Dead is a holiday celebrated in Mexico to remember departed loved ones. 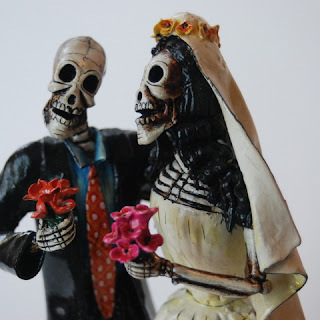 The holiday reminds us that life is short, the cycle of life is omnipresent, our loving relationships are paramount and the spirits of the dead are always with us. 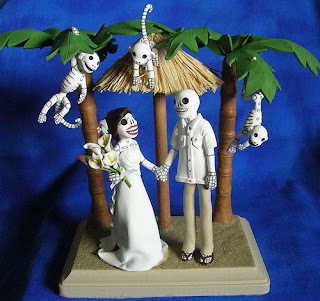 or even if you are having a beached themed wedding you can still opt for this with this beachy skeletal version equipped with three monkeys a palm tree and everything! 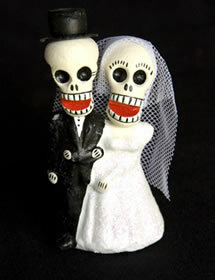 And here is a day of the dead wedding cake topper made of clay that is extremely cute! 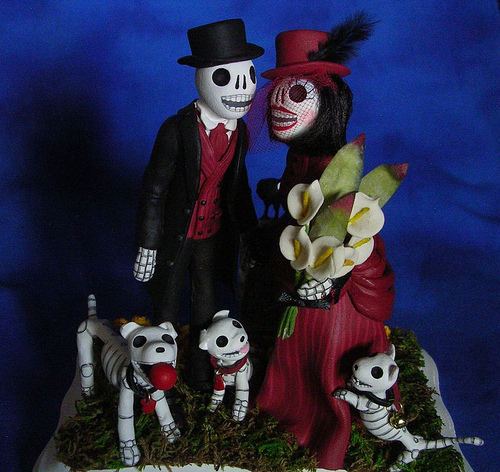 We hope to have inspired you with your search for your skeleton cake topper, we sure had a lot of fun looking at all of these!